(researched by Taryn Jones – “Tooshay Pomeranians” from records to 1979). One of earliest known Pomeranians to come to Australia was a chocolate brought out by the late Jack Maude’s father in 1910. Unfortunately, no records exist relating what happened to him. The late Mr Claude Lambert, whose “Egyptian” prefix was still carried on by his daughter Mrs. Phil Lawton, had owned and bred white Pomeranians before 1935. By buying in and using Mr Cook’s stock, he developed a strain of winning dogs – champions and grand champions. One of his daughter’s most prized possessions is a cup from the Pomeranian and Pekingese Club, which was won outright by her father by winning it three times. The cup was first presented in 1929 and finally won in 1947, the year before the Pekingese breeders formed their own club and the joint club disbanded. In 1948 Mr Lambert won both miniature and overweight Pomeranian “championships” with Egyptian Hurricane (min) and Egyptian What’s Wanted. The Egyptian prefix is now 50 years old! Another early breeder was Mr Kincaid – “Lilyfield” – who owned Jeanine of Lilyfield and unbeaten champion in her day. Jeanine was the dam of two top winning Poms – Topnoch of Lilyfield and Monarch of Lilyfield. Mr Hawkless (Hawlock), Mrs Morcana (Angora), Mr Cavanagh (Waverley), Anne Homers and Mrs Boggs. The overweight class was not withdrawn until the 1940s and at that time there were also classes for the various colours at Sydney Royal! This information supplied by Mrs P Lawton – 1959. Mrs Eunice Warner of (Miyu Pomeranians) wrote these thoughts on the breed…. Many years back here I believe there was an under and over 7lb class; if there is a record of Australian history, I am not aware of it. If there is such a book I would be most interested to hear of it. Many of the older breeders and exhibitors had retired from the ring when I started to show. However, Mrs Collins of the “Pomdale” prefix and Mrs Rosier of “Metro” prefix have mentioned names like Mrs Archer – “Maybole”; Mrs Leveridge – “Mountroyal”; Mrs Montcrieff “Calanoneon”; Mrs O’Toole – “Cliffedale”; Mrs - “Oakland”, and many more before I began to show. Pomeranians have had some success with major wins with “Hawlock Daffodil” at Sydney and Melbourne with in show awards. Mrs L O’Toole took a group a Melbourne Royal in 1973. 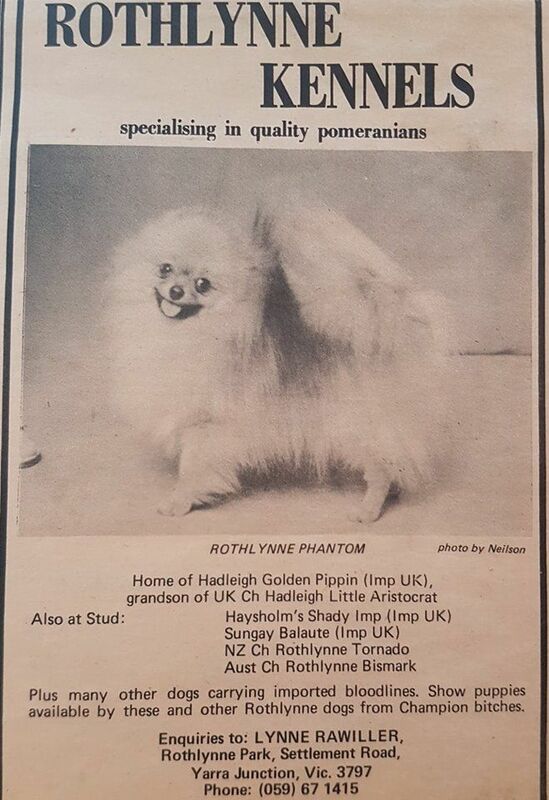 We have had our share of Royal wins in our short showing career: - Puppy in group Adelaide Royal 1971 was “Miyu Sable Prince” who later became a Singapore champion and was top Pomeranian there for 4 years. “Treaizon Prince Robyn” won puppy on group at both Adelaide and Melbourne Royals 1973. 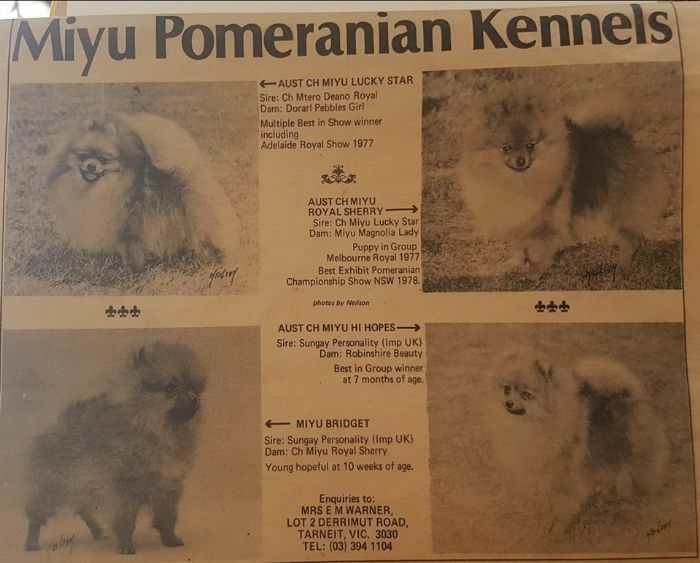 “Miyu Royal Sherry” – puppy in group Melbourne 1977; “Miyu Lucky Star” – climaxed our wins with best in show Adelaide Royal 1977 and then “Miyu Royal Sherry” went best exhibit In Pomeranian show NSW in 1978. I am of the option that little dog is an ideal pet, a good watchdog, highly intelligent and very proud when kept clean and well groomed. I do say that when you want to show and win you must first buy a good, well-bred specimen as possible – by well-bred I mean from proven winners and a pedigree of true type, but these are not easy to buy as most breeders hold them for showing themselves. At least 50% is in the breeding then 50% is in the rearing and caring. Not just on show day but 7 days a week and exercise. A Pomeranian is a toy, true, but all our big wins have followed a lot of roadwork and I mean walking on the lead, not just trotting around the yard. Then the grooming, every day, vitamins and good food and a weekly trim, not prior to the show or near it. A winning dog must be on the same wave length as its handler for regular wins. Grooming gear is important, good brushes (bristle), and good combs and scissors, very important is the grooming dressing, we find different brushes and grooming preparations vary from dog to dog. Atmosphere and coat textures mean such a lot in the final results. All this is hard to understand and takes a long while to learn. I remember the time we started some 12-13 years ago, we were told beer made a good coat-dressing; we were told how to use it though! We diluted it, used it flat and stale, fresh, always, and finally decided after some sticky and messy dogs, that the best way to use beer was to drink it while you groomed your dog.